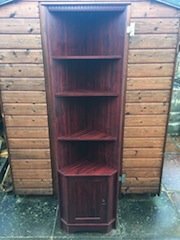 House Clearance Service In All Areas Calverley Farsley Guiseley Rawdon Horsforth Pudsey. 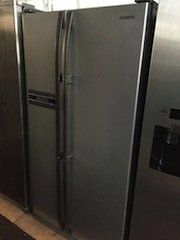 I have a partially furnished 2 bedroom house that I need cleared. In the kitchen there is a small table and some cutlery crockery and cookware, no white goods. One bedroom (upstairs ) just has some cardboard boxes and bric-a brac. 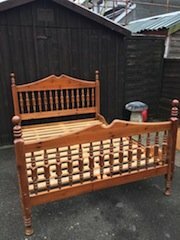 The other has a sleigh bed which will possibly need to be dismantled, a shoe cabinet some bedding, towels and coat hangers. the living room has a leather swivel chair and footstool, a cane chair, another footstool, a metal table, a nest of tables, a magazine rack, rug and wall unit. I think there are some pictures on the wall. The hallway has some odds and ends and a hoover. Apart from the bedroom with the cardboard boxes the house is all on one level. The front door leads onto the driveway where you can park your van. Thank you! 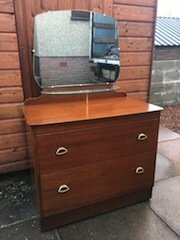 A large solid wood vintage dressing table, having a large removable mirror above a glass shelf, with two brass handled drawers. 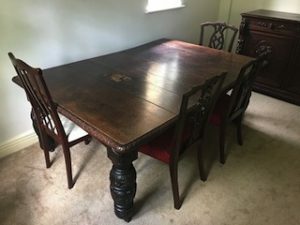 A large late 19th century solid oak dining table, together with four dining chairs, upholstered to the seats in red fabric. 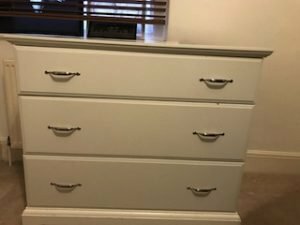 A hand painted white solid wood chest of drawers, having three drawers with two chrome handles each. 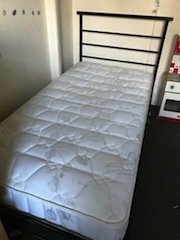 A black metal single bed frame, together with a white single mattress. 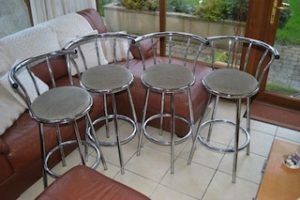 A set of four curved back chrome barstools, upholstered to the circular seats in grey fabric. 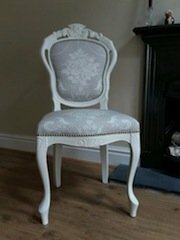 A hand painted cream heavily carved hall chair in the shabby chic style, upholstered to the seat and backrest in grey patterned fabric with nickel studded details. 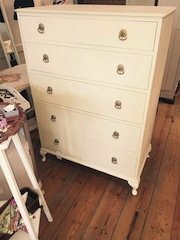 A hand painted cream tall solid wood chest of drawers on splayed legs, having five large drawers, each with two brass handles. 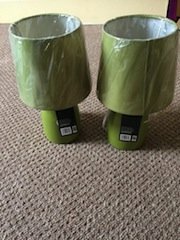 A pair of brand new lime green ceramic table lamps, each with matching fabric shades. 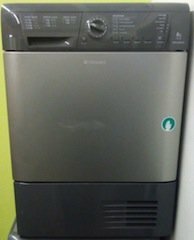 A space grey Hotpoint 8kg under counter condenser tumble dryer. 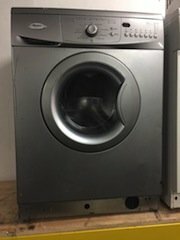 A silver Whirlpool 6kg 1200 spin under counter washing machine. 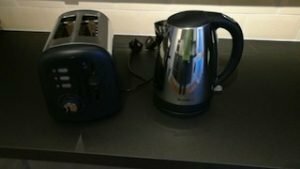 A black and stainless steel Breville kettle, together with matching two slice toaster. 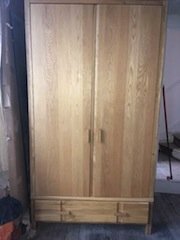 A tall standing solid oak double wardrobe, having a large drawer to the bottom. 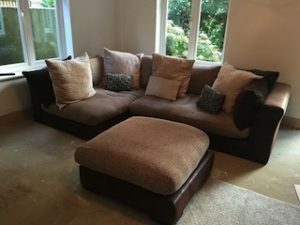 A four seater left hand corner sofa and matching square footstool, upholstered in chocolate brown leather and tan fabric.